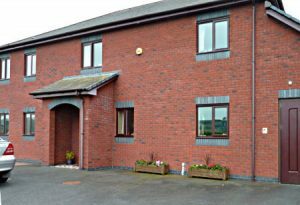 Situated on the eastern edge of Crossgates. (Knighton/ Kington Road A44) From Llandrindod take 3rd exit off the roundabout. Drive past the service station LHS, under the bridge, past the school on RHS. Turn right by the 50 MPH sign. (These landmarks are very close together) Drive up the hill for 100 meters. Turn right. Rhiwy is the house on the left at the top of the slope. Name is on brick pillar at the entrance. With the rain water harvest system being used to flush toilets and yard/garden watering, the annual bill is £210. The purchase of the system was £1700. The installation cost was minimal as the property was under construction and equipment required on site. This system has paid for itself many times over. It should be in housing regulations that all new build houses should have this system. Using costly treated water to flush loos is no longer acceptable. Washing machine and dishwasher are mostly used when the sun is out, as is power washer etc. *Only used on a hand full of days in 12 years. I saw it as not only in our interest to do this work but to show others that with care and planning we can bring down running costs and in turn have more comfort within the home. At the time of construction, the house was considered relatively well-insulated and the high thermal mass has always made a noticeable, positive contribution to comfort levels. 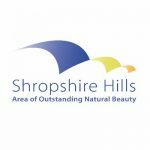 Although we have not regretted the decision to commit to using our own timber resources for space heating and DHW, it does in practice require a great deal of planning ahead and manual interaction (tree & hedge work; collection by trailer; storing & drying under cover; bow-sawing & chain sawing). So the approach presupposes that you remain reasonably fit, enjoy these physical activities and the inter-relationship between the home and the environment. Both of our solar systems – in particular our choice of hybrid PV system which incorporates a battery as well as still being mains-connected – similarly require regular human interaction in order to monitor, optimise and maintain performance and the production and use of energy or hot water. Please note that SAT NAV is not available for locating this home. 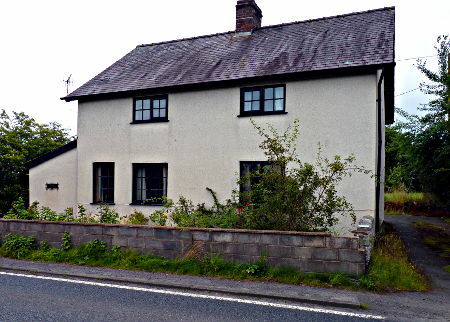 Cellws Cottage is on the right hand side of the A483 three quarters of a mile after the Tremont roundabout when travelling towards Crossgates. In more detail from Llandrindod people should drive north towards Crossgates. After passing the Tremont roundabout they will see on the left hand side the new T hire premises. There then some cottages, a bungalow and a further cottage. Situated on the RHS of Tremont road (Road out to Crossgates) on RHS next door to the Ford Car Dealers. Intend to integrate biomass heating due to family ownership of local woodland. Plans for wrap around conservatory on display. Go left to station crescent then turn right uphill towards the main road. Cross the main road into Craig Road and proceed into Broadway. Continue to end and turn left into Cefnllys Lane. The house is approximately 150 meters on the left towards entrance to the rugby club, park at the far end and walk up to house front door. Car Parking is easiest in a cul-de-sac below The Warren with a pathway up to the front door. The garden includes 2 ponds. Children should be supervised at all times. Please do not park on the passing spaces or grass verges along Park Lane. Please go up the drive and park at the top. Extensive draught sealing and testing to achieve 2.8 air changes per hour. Glazed areas have been reduced and triple glazing installed. 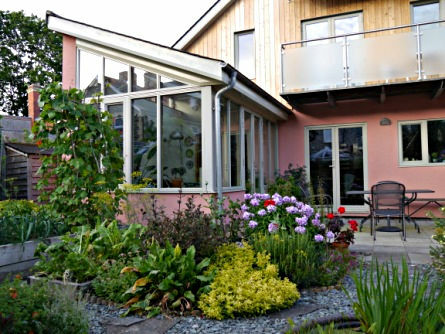 Primary heating using room-sealed wood stoves “Winter garden” for solar gain. Solar Hot Water. Raised beds, greenhouse, organic gardening and application of permaculture principles, early stages of establishing forest garden. Major project to retrofit a 1970’s bungalow to achieve standards close to Passivhaus. Net household energy cost (electricity, firewood) now approx £300 per year. Very pleased with the result. Home was not occupied for the 2-year reconstruction period – it would have been very hard to do had we been trying to live at the property during this time. Goylands Close is not long, but has three branches which may be confusing. As you come along it, ignore the first branch on your left. You will see no. 20 almost straight ahead of you where the road branches again. The number is on the door, but the 6 solar panels on the roof make it easily recognisable from a distance. My own car will be parked close in by the house; there is room on the drive for one other car. Any additional cars can be parked on the road. The outer front door may be shut but does not lock; just open it and knock on the inner front door (or ring; but the bell is a bit temperamental). Loft has a thick insulation layer – sorry, cannot remember how thick. Heating is controlled via the boiler’s thermostat (usually set at 18 degrees). Curtains chosen for their draught-proofing value. Double glazing was in place when I moved into the house. Fluorescent lighting in the kitchen and the living-room. Low energy light bulbs elsewhere. LED bedside light. When I have had to replace white goods I have gone for the low energy kind. 6 solar panels on south-facing roof. Intending to install rainwater collectors. I have a car, but I use public transport (trains and buses) when practicable, and sometimes walk the 2 miles into town. I grow some food, – the relatively easy things, beans, strawberries, raspberries. 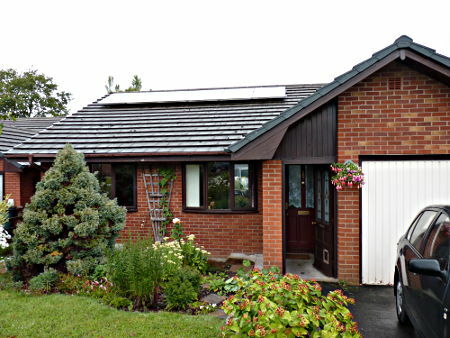 Detached bungalow, built probably early 1990s, exact date not known. 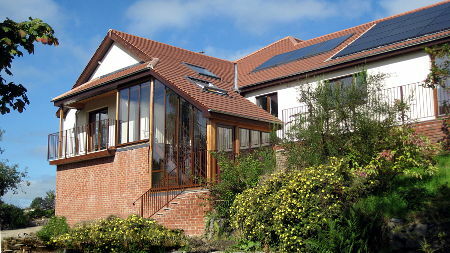 Solar panels were installed by Solar Fusion in 2011 at a total cost of £9,250.00 (including VAT). Boiler and all associated works – radiators, pipes, new hot water tank, flue – installed in January 2014 at a total cost of just under £13,000, by Llani Solar. I was able to claim some of this back via a grant, after the work was completed. The boiler burns wood pellets, delivered in 10 kg bags, 96 bags at a time. The most recent delivery cost £274 (including VAT). Three deliveries per year seem to be sufficient; of course, far more are used in the winter than in the summer. I buy them from R.A. Owen and Sons in Llandinam; they deliver very promptly. There is a generation meter for the solar panels, and I read this four times a year and forward the information to an electricity supplier; I then receive payment for electricity generated. Some of the electricity generated is used by appliances in my house, thus reducing the amount of energy I have to buy from the grid; for this reason I try to run the washing machine, do the ironing and charge mobile phone etc. during daylight hours. Before I had the boiler installed, heating and hot water was all electric, night storage heaters in the hall, living room and back bedroom, electric fires in the two front bedrooms, electric heaters in the bathroom and shower room. (There is no piped gas in Goylands Close). Heating costs considerably less since the boiler was installed, house more comfortable, temperature more controllable, damp (which had previously been a problem) considerably reduced. There are radiators in every room except for the shower room which is very small. After the installation of the boiler I was able to claim a grant. Follow the one way system that takes up the High Street. At the top follow the bend round to the right. Straight on to the Y junction go left past the Police Station, straight on to the roundabout. Take the right exit. You can then turn immediately left into Broadway or follow the road round and park in Park Road Side road to home is at the top of Park Road on the LHS as you come from the roundabout. New Build 2010. Highly insulated timber frame construction. Insulation 75mm sub-plinth, 200mm walls (Warmcell + Kingspan), 320mm roof (Warmcell). Well sealed airtight sealed timber framed building. Approx 195 sq m living space. 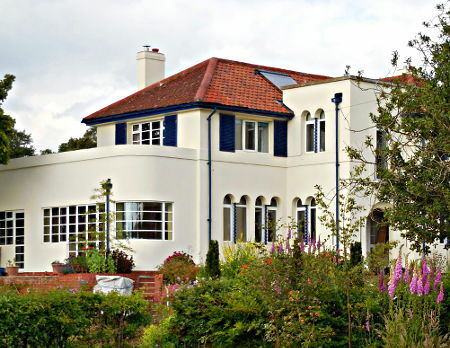 Original Heraklith/render finish failed and has been replaced with part timber, part Knauf Aqua panel + thin coat render. 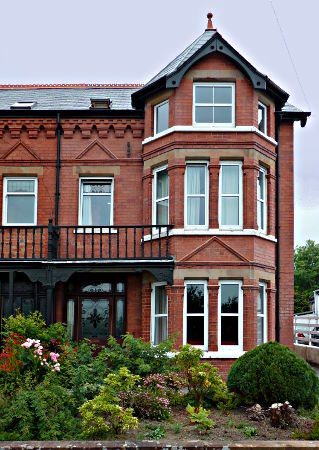 Triple Glazing: wooden windows externally faced with Aluminium made by Nordan Ltd. Designed to be used in a house with an active ventilation system since they have no vents. Low energy lighting throughout. Mechanical Heat Recovery and Ventilation system (Villavent ltd). Condensing mains gas boiler for backup hot water, also supplies back up under floor heating downstairs. No upstairs heating apart from Bathroom towel rails. Solar water heating (Velux), supplies approx 75% annual needs (2430Kwh/yr). 4Kw High efficiency (>80%) wood burning stove. Managed wood land provides all annual fuel needs with excess given to others. 1.3Kwp photovoltaic (PV) system provided by LlaniSolar. All Rainwater collected no surface water runoff to sewer system. Rainwater used for toilets, outside taps (irrigation). 15×6 metre rear garden – wood store, greenhouse, clothes drier. Raised vegetable and fruit beds, pond, seating, flower/shrub borders. No pesticides/chemicals apart from the occasional slug pellet in spring under cloches. Total imported energy amount (electricity and gas) for heating, lighting, cooking = 58.7 Kilowatt hours per square meter of living space per year. 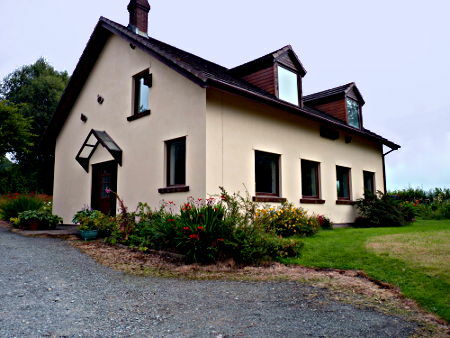 (Passive House standard = 35Kwh/m2/yr, Old housing stock up to 250Kwh/m2/yr). High level Feed In Tariff for PV system (annual average £443.36 over 5 yrs) and Renewable Heat Incentive payment for Solar hot Water (commenced 2015, annual payment £474.08 for 7 yrs). Actual energy costs taking estimated costs of 4.25p per Kwh for gas, and 15.5p per Kwh for electricity (both these vary over time), average at £385 per year for gas, £370 per year for electricity, total £755 per year. Net ‘profit’ of approx £160 contributes to cost of systems installed at time of build. SAP rating (February 2015) of 73 current and potential, with estimated energy costs of £1470 per year for lighting, heating and hot water (cooking not included) overestimates costs by more than 100% compared with true costs – SAP system is mis leading and inaccurate for houses of this type. The original external cladding of Heraklith and Sand/cement render failed, partly due to poor construction techniques. Last autumn it was replaced with a mixture of Larch timber boarding and a more durable cement board with thin coat render system. This has so far been excellent and has enhanced the appearance and longevity of the house, but did involve considerable unexpected costs. Lightfoot Services © 2019. All Rights Reserved.